I’m back! Well, mostly. Thank you for all of the wonderful prayers and well-wishes over the course of the last week during which I have been recovering from the emergency appendectomy I had last Thursday. Our holiday plans were certainly thrown for a loop, but I am so thankful that this happened at home rather than in New York, where I was the night before I got appendicitis, or in Kansas City, where we were supposed to go for Christmas. I am incredibly grateful for my wonderful husband who has not left my side as well as my amazing surgeon. I really have the best doctors! Can you believe it is the end of the year? It’s been a very challenging year for us in many ways, my health included, so I am ready to say goodbye to 2012 and ring in 2013 with the hope that I won’t be needing any surgeries next year! The final “fabulous room” of the year is this lovely bedroom by Miles Redd. I’ve spent a lot of time in bed over the past week, so I know the value of a beautiful and cozy bed. 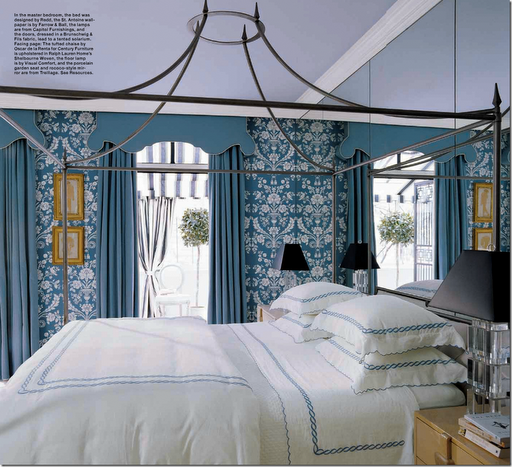 This bedroom is chic and stylish in a very classic way—from the embroidered linens and blue palette to the campaign bed and wallpaper. This room is traditional done the Miles Redd way—with the volume turned up! I predict that “pretty” and “traditional” will be quite big in 2013. Stay tuned because next week, I will be sharing the predictions of several respected members of the design community regarding what will be big in 2013 and what we should leave behind in 2012. For more on Miles Redd, check out the amazing interview and tour of Miles’ fabulous townhouse on my dear friend, Mark D. Sikes’ blog! I am sooo glad you are doing better. The bedroom by Miles is a perfect balance of clean lines plus luxe details! Let me know the next time you come to Kansas City....sorry you missed the Plaza Lights! So happy you're home. Do take it easy. So happy you are doing better! May 2013 bring an abundance of blessings to you! So happy to hear you are on the mend. I wish you all the wonders of beauty for 2013 !